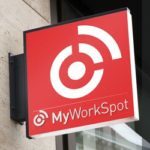 MyWorkSpot Launch Countdown – This is not a drill! Launching what? As succinctly as I can, MyWorkSpot is a flexible office, meeting and event hub right in Maidenhead town centre. Designed for local freelancers, corporate commuters, and start-ups in need of flexible hot-desk and meeting space, or for more established businesses looking for permanent fixed desk, private office options, meeting rooms or event space. Why are we doing all of this? Put simply, the way we all work is changing and we believe that this key cross-section of our local business community is currently underserved in terms of affordable, flexible (and quality) workplace options. Our mission is to provide Maidenhead’s start-up and small business community with an accessible and inspiring place to work, collaborate and prosper. Whether it is a freelancer looking for somewhere quiet to work for a few hours, to a more established business in need of a permanent office base. Does Maidenhead even need such a thing? From our very first coworking get-together at Maidenhead Rugby Club back in September last year, the answer has been a clear ‘yes’. Not just my words, but the actions and footfall of Maidenhead’s small business community who have over the past 7 months have valued the opportunity to cowork and collaborate with like-minded others. Just some of their feedback below. While I was very nervous on the morning of the first event on 23 September in case no one would actually show up! Those nerves were quickly put to rest, and I’ve been delighted with the strong and friendly community of Maidenhead coworkers that we have been able to build since. Community is the key word here and what is vital that when we enter our permanent venue that we provide more than just fantastic facilities, but continue to provide real opportunities for our members to learn, grow and prosper through our regular expert speaker, networking and social events. Steve Cox – Owner Totally Video. The co-working days have been brilliant because they allow me to actually feel as if I am working back in a social office environment. From them I have got the social interaction I craved (whilst still being able to get on with my work), found new networking opportunities, built connections with the other local businesses and expanded my own personal learning through the lunchtime learning slots.